With your blood you purchased the crown of the Martyrs. Not like Christ who carried the titulus as plunder above. Were established as sons of God the Father by the sword. Having affirmed her suffering now, Paula is beheaded. Saint Loukilianos flourished during the reign of Emperor Aurelian (270-275). He was a priest of the idols, elderly in age with white hairs, and lived not far from the city of Nicomedia. Having converted to the faith of Christ, he was brought before the prefect Sylvanus. 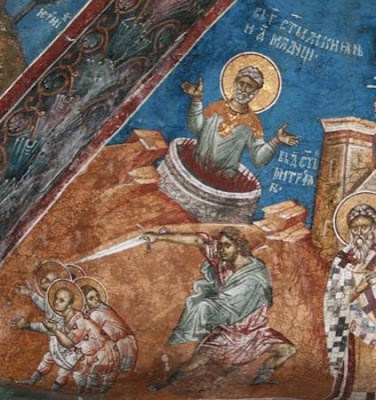 Because he was not persuaded to deny Christ, and return once again to his ancestral religion of the idols, for this reason they punched him in the jaw, beat him with rods, and suspended him upside down. They then placed him in prison, in which also there were four children locked up for their faith in Christ. Taking him out of prison with the four children, they all stood before the prefect. Remaining steadfast in the faith of Christ, he was put, together with the four children, into a lit furnace. However, a heavenly rain came down and extinguished the flame, therefore the Saint came out of the furnace together with the four children without suffering any burning. The prefect then ordered for them to be sent to Byzantium, where the Saint and the children were to be killed. Thus the holy children were beheaded. 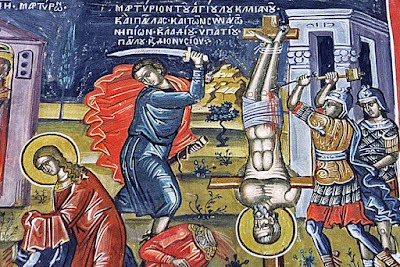 Saint Loukilianos was crucified on a cross, and he was torn at, then they nailed to the cross the necessary members of his body. In this way the blessed one delivered his soul into the hands of God. 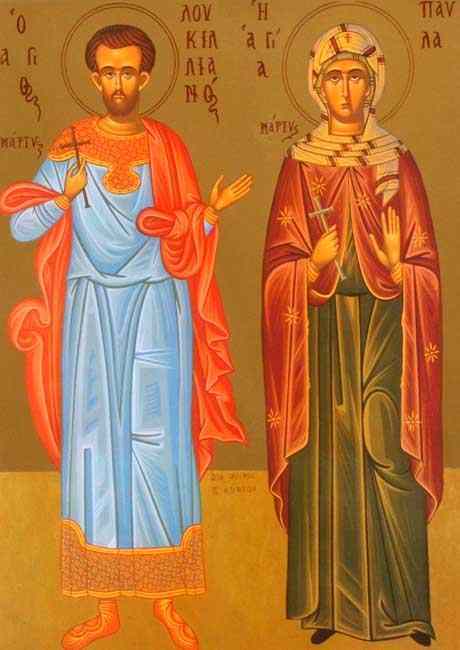 The Holy Virgin Paula was together with the Saints on the road, and took care of the wounds of the Martyr Loukilianos. When the five had been put to death, she gathered their holy relics. She had been a Christian from her forefathers, and it was her job to enter the prisons, where she would treat and care for the suffering Martyrs on behalf of Christ. For this reason she was arrested and brought before the prefect. Because she was not persuaded to sacrifice to the idols, first she was stripped of her clothing, she was whipped with straps, then she was beaten with rods. Since her body was broken from her many beatings, for this reason an Angel of the Lord came and made her healthy, and not only this, but he also strengthened her during her martyrdom. Therefore she was again brought before the prefect, and she insulted him, for which she was punched in the mouth and placed in prison. The Saint was then brought forward again for her third examination, and placed in a lit furnace, from which she was kept unharmed by the divine Angel. Finally the prefect ordered for her to be brought to Byzantium, where she would be beheaded. When the Saint arrived at the place of the execution of Saint Loukilianos and the four children, she also was beheaded there, and thus the blessed one received the crown of the contest. Their Synaxis and Feast is celebrated in their Holy Temple which can be found near that of the Archangel Michael, in the place called Oxeia. Like a radiant star thou didst shine out of the night of error, and didst slay the crafty enemy, O Loukilianos. Together with holy Paula and the four children, pray to Christ our God to save our souls. 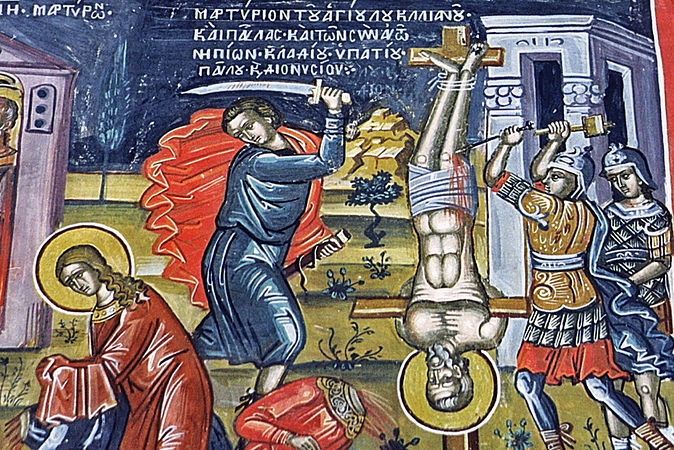 O glorious Martyr, thou didst endure grievous torments, and together with Paula and the children didst cry to thy Creator: O Savior, we are slaughtered like sacrificial sheep, through love for Thee.